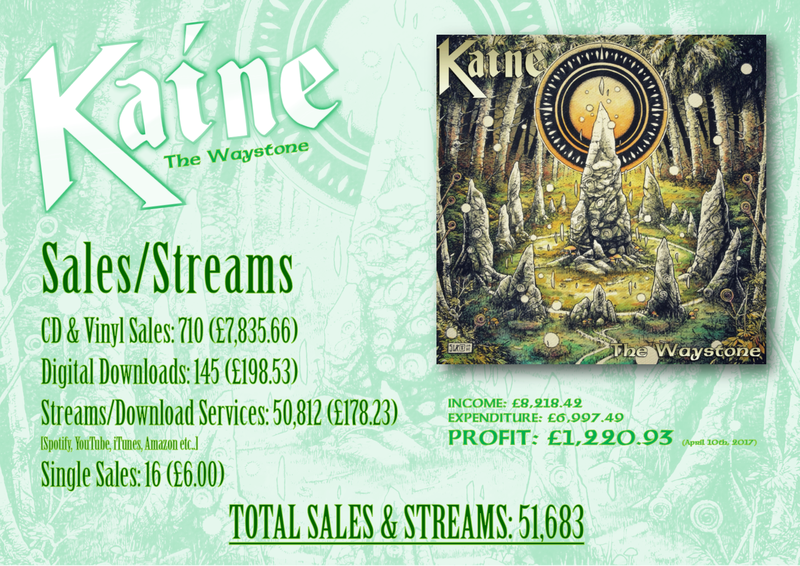 The Waystone, Kaine’s second album first released in 2014 has made a profit £1,220.93 with 855 sales, 50,812 streams and 16 single sales. This is a huge achievement for the band, who after dropping their label prior to its release funded the album themselves and pushed it hard online and at their many shows. Physical sales are still the bands strongest source of income for the album bringing in a total £7,835.66, with digital downloads at just £198.53. In terms of streaming income, and income from third party sources such as Spotify, iTunes, Amazon etc. despite the amount of streaming being relatively high (50,812) the return was just £178.23 (£0.0035 per stream/download) for the band. The largest amount of cost for the album was the production/mastering which came in at £4,888.64 and the duplication/pressing £2,108.85. The total profit for the album now stands at £1,220.93. Chris MacKinnon, drummer on The Waystone said of the news: “I’m still astounded. When we first released The Waystone, the thought of paying off the album expenses would dare not creep into my mind. There have been times over the years where my dwelling thoughts of the financial struggles of being in a band nearly became crippling. Every single time a fan would buy a CD at a show I would always thank them honestly, explaining how they really are the people that keep the band going. We often earn criticism from ‘real’ musicians who tell us what we’re doing is futile and we’re approaching the wrong way of marketing our albums, but whatever we’re doing right now is working – to the extent where we are now earning clean profit on my first real album – and the glistening hope I’m seeing for the future makes me want to scream with joy. Rage Sadler, who performed vocals and guitar on the album, added: “When we dropped the label we knew we were taking a huge risk moving forward, we tried to find another label to put the record out on but they essentially wanted all the profit in return for the album, one offered us 100 free CD’s at no cost we could sell ourselves, which would have left us significantly out of pocket! We were mocked in some quarters for not signing, some believing we were simply being arrogant in not doing so. We even had to drop a label after a month because they simply refused to print any physicals, despite us covering all the costs of the album ourselves. What this says to me, despite what some are saying about Metal being dead and how no new band stands a chance because nobody wants what we are doing anymore, is firstly how wrong those people are and secondly that hard work pays off. We toured relentlessly to promote this album, we took it on the road from every corner of England, to Scotland, Wales and even across the sea to Ireland. We have received a great amount of support from Metal fans right across the world who love what we do. After we released it, no major publication would cover it, no bigger festival would book us. We did this entirely off our own backs with the support of the people who genuinely love our music and that for me is the real achievement in this, because for a band our size to not only make a profit but bring in such a significant amount of sales and streams, but continue to do so nearly three years after the album’s release just shows the strength of that album and our live performances. One issue this does highlight is the amount a band our size gets in return for streaming services such as Spotify and YouTube, or sales from places such as iTunes and Amazon. Despite having over 50 thousand of these streams/sales, which is incredible, it brought in less than £200. These are big companies turn huge profits out of music, but it really isn’t filtering down to bands like ours and that’s the only negative out of today’s announcement. Kaine are currently gearing up to record their third album later this year as a follow up to 2014’s The Waystone.